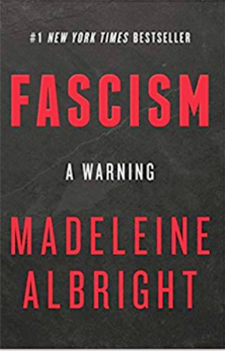 Madeleine Albright, the first United States female Secretary of State, will speak about her new book, Fascism: A Warning--in conversation with Pulitzer Prize-winning journalist and UC Santa Cruz alumna Martha Mendoza--on Tuesday, February 5, at the Kaiser Permanente Arena in Santa Cruz. The book is a personal examination of fascism in the recent past and how its legacy shapes today's world. It shows how fascism has not only endured through the 20th century, but now presents a more dangerous threat to peace and justice than at any other time since the end of World War II. Albright served as America's 64th Secretary of State from 1997 to 2001, and her career also includes additional positions at the White House, on Capitol Hill, and as U.S. Ambassador to the United Nations. "At The Humanities Institute, we are committed to engaging with anyone interested in compelling ideas and making sense of this increasingly complex world, noted THI director Irena Polic. 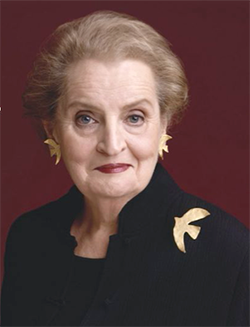 “We are thrilled to be partnering with Bookshop Santa Cruz on bringing Madeleine Albright to our community." "Bookshop owner Casey and I started working together years ago believing that together we really are stronger,” said Polic. “Our partnership allows us to leverage our networks and resources to bring speakers to our town that neither one of us would be able to attract on our own." "It is especially wonderful that we were able to get Martha Mendoza, a Pulitzer Prize-winning journalist and a UC Santa Cruz alumna, to be in conversation with Ms. Albright,” she added. “I am very much looking forward to their conversation on February 5th."